It seems like I’ve kicked the sickness & I’m off in a few hours to jerry-rig a solution for my car. Keep your fingers crossed that it passes inspection! Also, next Tuesday is the second installment of Alternative Thanksgiving: Pies & Bread. While most of you can’t be here for the demonstration, you can access the recipes I’ll be discussing and making, as well as other, under the Alternative Thanksgiving tab at the top of the page. Right now I’m working on compiling the pie & bread tutorials, so keep your eyes peeled for chocolate bourbon pecan pie (gluten-free! ), pumpkin pie (gluten-free! ), gluten-free cornbread, and others! Since I’m up to my eyeballs in work (school and real world work) and preparing for the demo, I haven’t had much time to cook for myself. Thankfully I have some great staples on hand–oatmeal, bananas, dried cranberries (fruit juice sweetened), maple syrup, and non-dairy milk (So Delicious Coconut Milk–yum!). 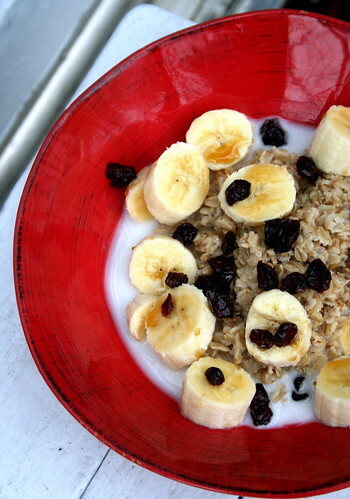 For a quick & easy breakfast, this one sure is filling and nutritious. Plus it’s colorful, which heaven knows we need during this bleak and chilly rainy days. I can’t wait to see the recipes for the alt thanksgiving! and your breakfast looks delicious! Haha thanks, Jes…she’s doing just fine. And thank you!! The casserole was great. Man that oatmeal looks rockin’. glad you are feeling better, fingers are crossed, and hooray for another installment of the alternative thanksgiving, Jes! totally gonna be on the lookout for those pies – especially the chocolate bourbon pecan pie. yay! That may be the prettiest oatmeal I’ve ever seen. Beautiful photo! How awesome! I wish I could come to the demonstration! Thank you for sharing all the recipes with us and good luck! I love that new so delicious coconut milk, it is great. Good luck with the demo! P.S. Your oatmeal bowl is so bright and pretty!